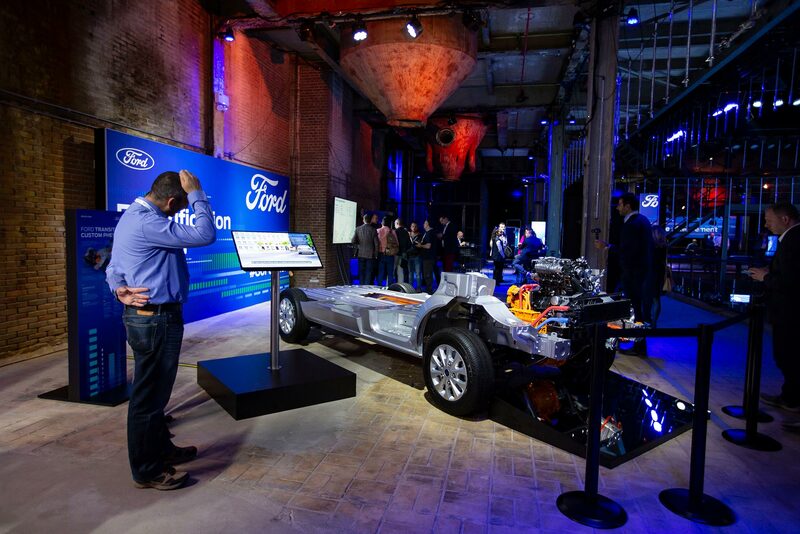 We went to Amsterdam to a special Ford event where the blue oval brand announced a new generation of electrified vehicles. Ford wants to make our cities cleaner and quieter by increasing the use of more environmentally friendly electric power. 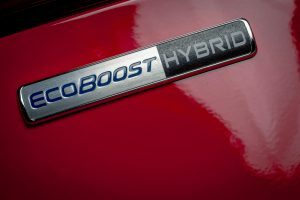 Some new MHEV mild hybrid models were revealed at the Go Electric event namely the Fiesta hybrid and Focus Ecoboost hybrid. These popular models represent the spearhead of Ford’s future line up of new electrified and all electric cars, SUVs and commercials. 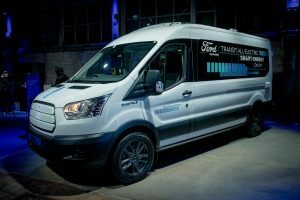 Ford is committing to a promise made earlier this year that every new Ford model will have an electrified version available. The event also showcased the new Kuga PHEV plug in hybrid. The Focus resembling five seat SUV has an EV only range of 50km and a similar range should be had from the new Tourneo Custom Plug-In Hybrid eight-seat MPV. Attendee’s appetites were whetted further with news of an all electric Mustang inspired SUV with a range of 600km that is due in 2020. It will be followed by a perhaps more significant electric Transit in 2021. 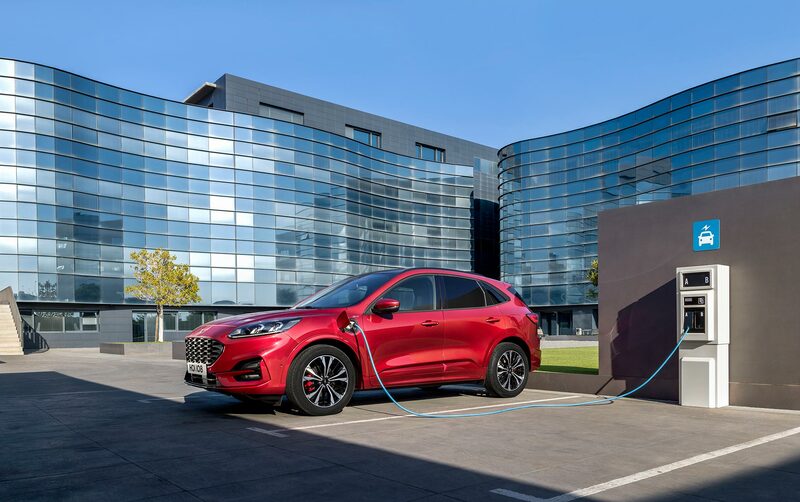 Despite Ford’s significant global presence it is coming very late to the electrified vehicle party. Smart vehicles for a smart world was the key marketing message delivered by Steven Armstrong, group vice president and president, Europe, Middle East and Africa, Ford Motor Company, and incoming chairman, Ford of Europe: “We’ve gone to every length to develop mild-hybrid powertrains for two of our most popular cars that will help keep cash in customers’ pockets while remaining true to the Ford ‘fun to drive’ philosophy.” Armstrong said. 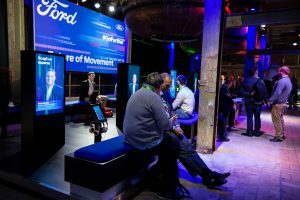 In November 2016 Ford held its first Go Further event in its Cologne plant. 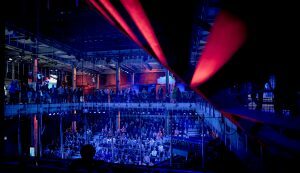 2,500 people gathered in the giant Hall W to hear Ford outline its vision of the future. 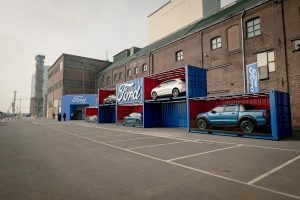 To keep the event routed in reality the latest Cologne built Fiesta, stunning Ford GT plus a number of other models were paraded as Ford stated its intention to shift from an auto maker to an auto and mobility company. This move would see it shift from swimming in a market worth €23 trillion per year to €5.4 trillion. 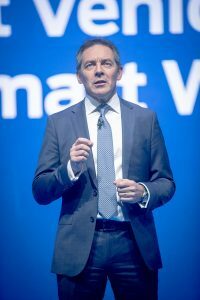 The then Ford President and CEO Mark Fields said “Our long term vision for ford is not just about selling cars but our overall long term vision is also about making people’s lives better, by changing the way the world moves, just as our founder Henry Ford did more than a hundred years ago”. The Transit van Chariot ride sharing was one initiative launched that seemed a sure fire hit but subsequently failed to take off this side of the pond. 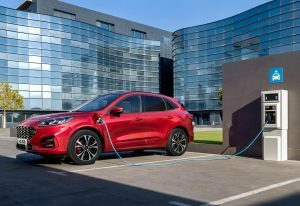 Ford is doing nothing particularly new with its Go Electric event, rather it’s highlighting the fact it is playing catch up with its key rivals who are much further ahead with electrification. 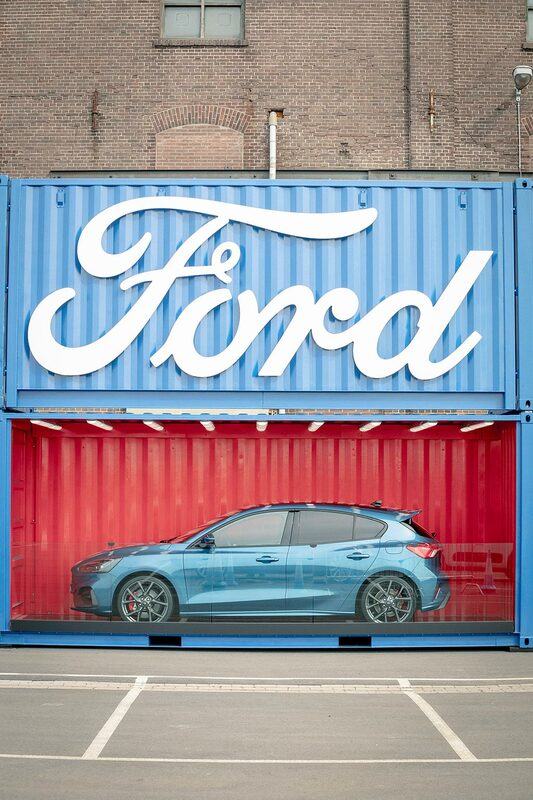 Ford has been stockpiling vehicles in the UK and moving engines in to Europe in advance of a hard Brexit. 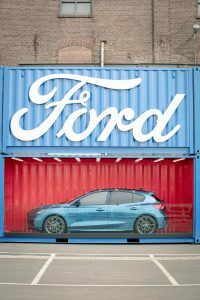 Ford has significant plants and R&D in the UK and finds itself under increased pressure with Brexit. 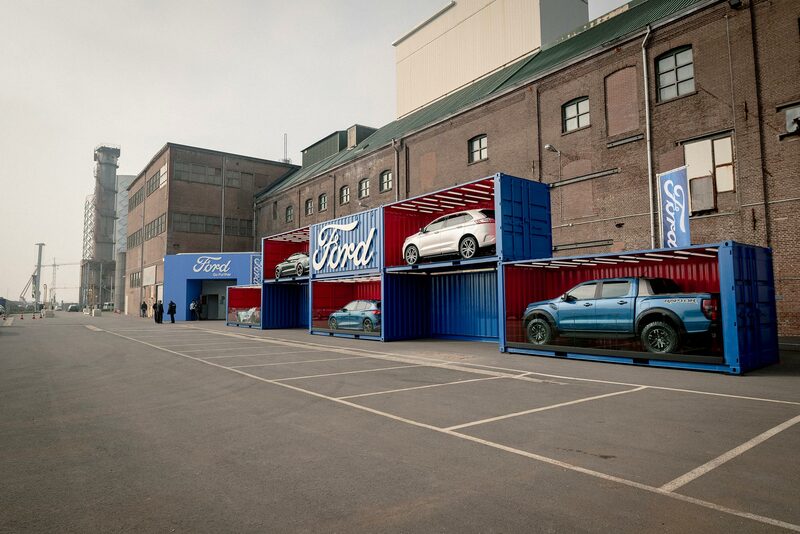 We spoke with Steven Armstrong chairman, Ford of Europe: “We’ve been very clear from the day after the referendum that we need a deal that gives us the opportunity to continue to trade with Europe without tariffs and no friction at the border. To us, no deal is not an option. We have to have a trade deal of some description. I’m a proud Englishman and a proud European and my personal choice would be to not change anything at all, I quite enjoy the status quo. Clearly we’re going to be leaving the EU that’s a decision that was taken and now we have to make the best of it. For me the important thing is to avoid tariffs, avoid friction at the boarders. A no deal Brexit would be a disaster I think for the UK motor industry and certainly for Ford, and I really appeal to the politicians to get around the table and come up with an agreement that gets us a deal so we can continue to have access to the EU and the EU can continue to have access to the UK”. Armstrong added: “You can mitigate some of the issues on day one by stockpiling but that doesn’t protect you beyond just a few days or a couple of weeks. You can’t stockpile enough stuff to get through that issue. So what we have been doing is moving engines from the UK in to Europe and components in to the UK and also more vehicles in to the UK than we would ordinarily would have, so they are the right side of the line if we do end up with tariffs. But ultimately if there are tariffs that cost will get passed through the system and it will impact consumers somewhere along the line I’m afraid”. Armstrong has the same concerns as fellow motor industry leaders with production plants in the UK: “We spent 40 years building a supply chain that takes advantage of the freedom and flow of goods across the channel and between Ireland and the UK So we have the same issues on the just in time (production method) as everybody else”. 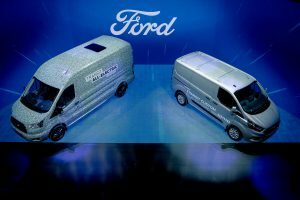 Roelant de Waard, vice president, marketing sales and service Ford of Europe on Brexit said: “We clearly have all kinds of contingency plans for whatever may be decided. for us the biggest impact that we have been living with for the last couple of years is the depreciation of the pound following the Brexit vote. That was a big challenge, we’re starting to get over that now. Yes it will be an issue and we’ve been very public to say it’s not a good idea for Britain to leave the EU. Tariffs will be a significant cost increase for the British public but also even if it’s a customs union where we have to import individual vehicles with friction at the border, the administration will be quite a bill. Free trade has its benefits and that’s why we for it, but then again we all have to live with what the end result is. Our sales volumes have stayed quite healthy in the UK despite Brexit”. Late to the hybrid party. 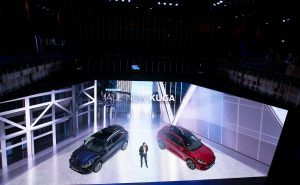 Ford showcased new electrified vehicles including Fiesta, Focus and Kuga hybrids and greener electrified commercial vehicles too that will be on sale this year. 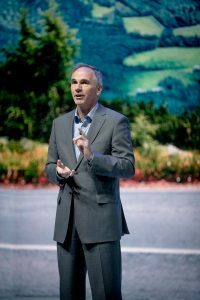 We asked Roelant De Waard why the blue oval is playing catch up with Toyota and others: “I don’t think we’re so much catching up partially, we are just maybe overly conservative. On the other hand until only a couple of years ago because of the diesel scandal we were all diesel in Europe because diesel is the more economical solution and in the US people were in hybrids. Diesel has been, rightly or wrongly, voided (banned) for many cities, so that’s when you have to come up with alternatives. Luckily we have a good hybrid experience around the world and we could very quickly bring the Mondeo hybrid (to market). Our mild hybrid technology was already in the works but it takes a couple of years to develop. The timing now is right because next year is when all the manufacturers have to make a major step in CO2 reduction. This is the moment where it becomes relevant for customers, and it is the right time for us to start to promote and launch these vehicles. Customers will start to buy them, as the timing fits, before that very important 2020 year”. Steven Armstrong: “We’ve been selling hybrids since the early 2000s in the US and we were the second largest producer of hybrids globally behind Toyota. To be quite frank we didn’t see the need for it (hybrid) in Europe until relatively recently. We’ve been selling very well with our Ecoboost gasoline engines and diesel portfolio that we have. So now as the market shifts a little bit and diesel of course is under some pressure for lots of different reasons and emissions requirements require it we’ve decided now is the right time to launch it for Europe. Toyota is a relatively small player in Europe. We’ve 16 vehicles announced today with eight coming by the end of the year we’ve a great response to customer demand for electrified vehicles”. Steven Armstrong: “Our mild hybrid is a little different as we use it not only to help with fuel saving but also to supplement power to deliver better performance from a small engine. The small engine work is done in house in the UK. 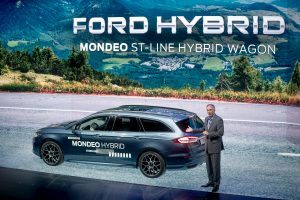 Larger Ford hybrids like the Kuga and Mondeo use power split technology developed by Ford in the US”. The mild hybrid unit allows a bigger turbo to be used so you get 1.5 litre performance and 1 litre economy from a 1 litre engine. Mustang based premium electric crossover. 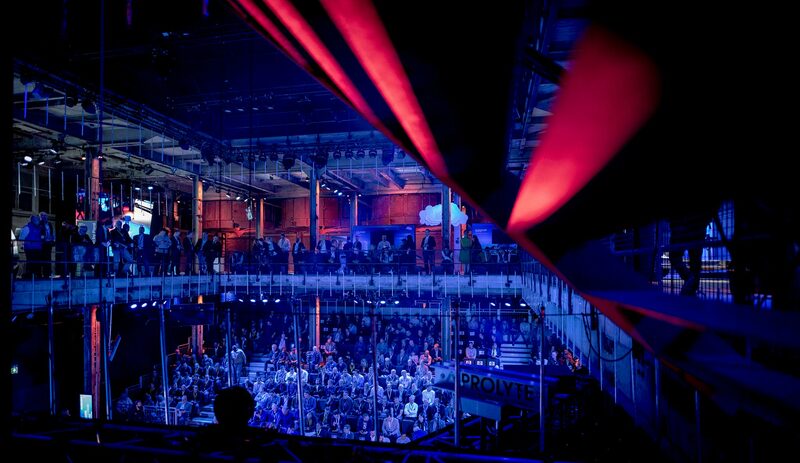 The talk of the Amsterdam event was a concept that is coming to life. Steven Armstrong on Ford’s new EV: “The first of our full EV vehicle using the Mustang as a base gives us a great position, it will be a truly fun to drive car. 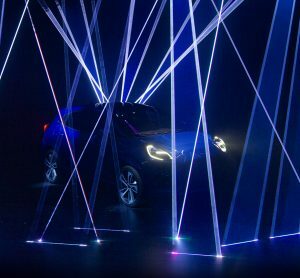 We like to start with this flagship positioning – it will have all wheel drive and two wheel drive depending on specs chosen”. Roelant de Waard said: “The 600km range electric flagship is based on the Mustang and a premium execution. Pricing will come later but it will be good value with faster acceleration than a Mustang V8. It will be a crossover and will have the appeal of a Mustang”. The future post Brexit and RHD models. Steven Armstrong: “The U.K. is a very big part of our business. We will continue to develop and sell vehicles in the UK. If it becomes prohibitively expensive to do certain things in or for the UK we’ll have to rethink it. If the market demand is strong we’re the number one brand in the UK, we plan to defend that position and we’ll continue to develop RHD models”. 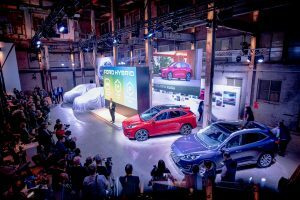 Steven Armstrong says no, for now: “By 2025-ish we expect 50 per cent of all vehicles sold to be electrified. So 50 per cent will still have an internal combustion engine. Diesel engines in small vehicles will become less viable, the cost of putting the (emissions reducing) after treatment on the vehicles is so high it just doesn’t make sense. so will expect to see more mild hybrids in small vehicles. But bigger diesels will still work for you say in a Kuga where you might drive 20,000km a year. We have a fabulous range of diesel engines that are all Euro 6.2 compliant an Euro 7 is some years away, and we will develop then until demand tails off or emissions regulations dictate”. 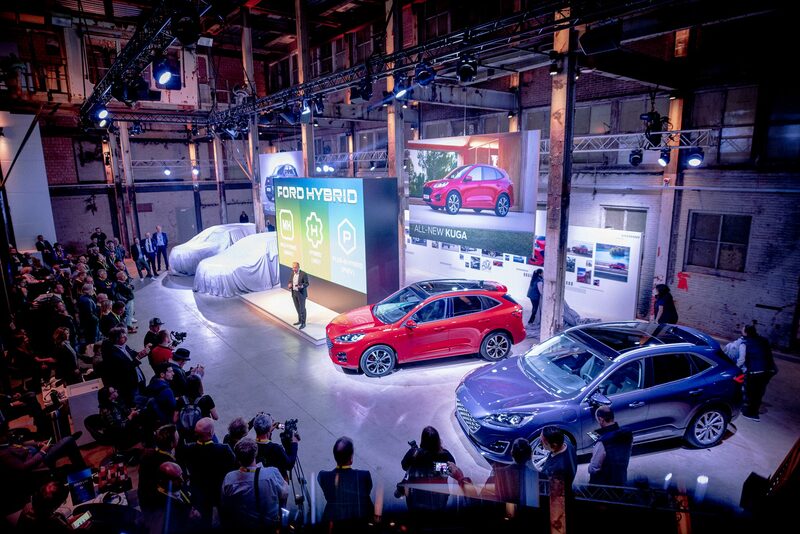 Speaking on the practicalities of producing electrified vehicles Roelant de Waard: “All these vehicles will be built on regular production lines. Mild hybrids are relatively easy as the technology is bolt on”. We asked de Waard is the saloon car dead? “It is in decline but the Mondeo estate is very popular whereas the four and five door is losing popularity in both the Focus and Mondeo segment. The Mondeo wagon hybrid is a very good package and even more economical too next to a diesel Mondeo”. As for talk of a seven seat Grand Kuga or a right hand drive Explorer were dashed. 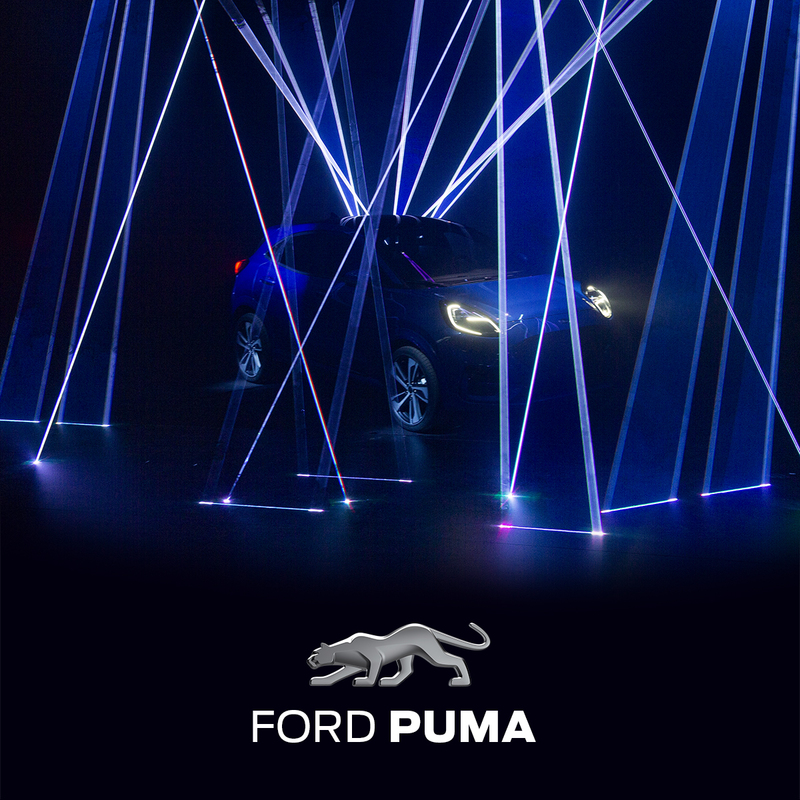 The new Puma crossover was driven on to the stage under strobe lights to tease the audience. The Puma is slightly bigger than the Ecosport and smaller than the Kuga. Ford says its customer base will use it to do both long and short journeys. There will be demand for diesel in this model but it will sit right on the tipping point with mild hybrid.